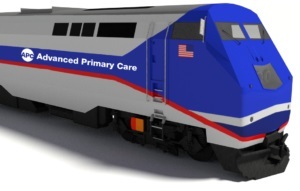 NEBGH, together with the NYS Department of Health, is leading efforts to transform primary care in the New York City metro region and the Capital District/Hudson Valley! We’re working with health plans, physician practices, and other key stakeholders to design, test and evaluate a new model of advanced primary care now known as the New York State Patient-Centered Medical Home (NYS PCMH). These efforts got underway in late 2014, when NYS received a $99.9 million State Innovation Model (SIM) multi-year grant from the federal CMS Innovation Center. The idea is that advanced primary care is the foundation of better health for all New Yorkers and the critical element for a value-based care and payment strategy that transforms the delivery system. Primary care practices are eligible for dollars and assistance to transform their practices via technology, care coordinators, integrated behavioral health, and other enhancements, and will then need to demonstrate improvements in quality and patient experience to qualify for reimbursement under the new model. The goal is that 80% of NYS residents will receive primary care under a value-based payment model within four years. The New York State Department of Health worked with NCQA to develop an exclusive transformation program for New York state practices. The new NYS Patient-Centered Medical Home (NYS PCMH) program supports the state’s initiative to advance primary care and promote the Triple Aim.